As Training-online.eu provides the eShop marketplace solution, you may display your courses in the eShop. You may integrate the eshop to your website and every internet user that passes by your website may visit the eShop and purchase the course(s). As he orders the course to study, the user must pass the eShop registration process and as he registers, he becomes your LMS user as well. 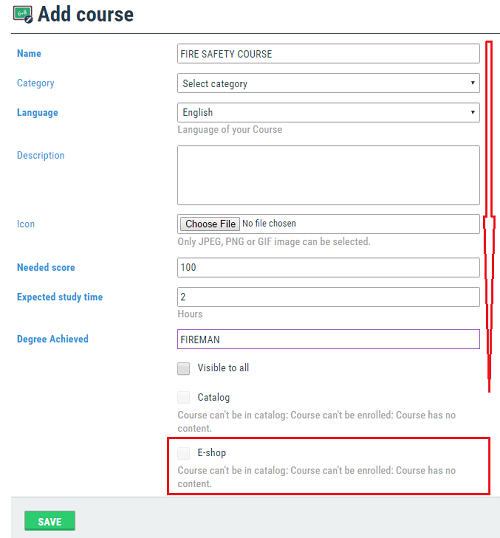 This registered user status allows him to study the course he has ordered in your LMS platform. See how to turn on your electronic course marketplace. login as an admin, go to settings and select the eShop tab. The eShop functionality is switched off by default and you need to turn on by clicking the checkbox. Fill all the details, the eShop page is also the page where you set your eShop billing details that will be shown on invoices. 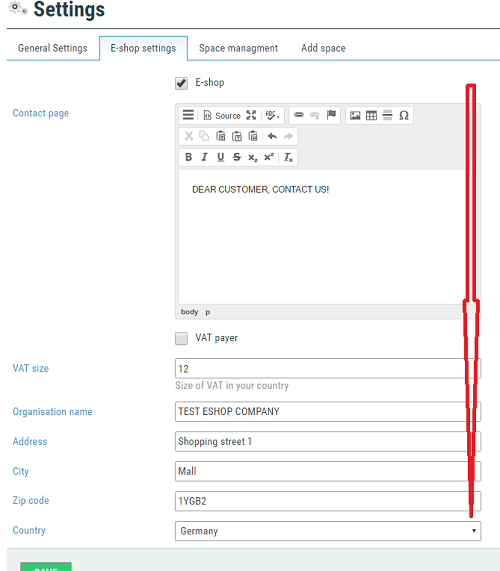 Please fill properly also your VAT status and VAT size for your country. 2. As you turn the eShop on, it will become visible to all internal users and to external users as well. You may add the address to your website link to the eShop. In case you use the domain redirection the user will not recognize any address change and will feel he is still in your system. a. 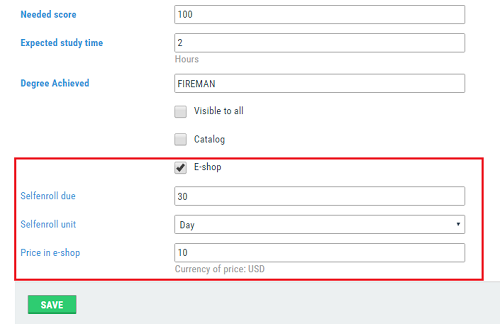 As you create the brand new course logical unit there is a checkbox to eShop display. The checkbox is active only in case there are some lessons included in the Course. b. If you open courses with existing lessons, the eShop checkbox is active. For cases of some lessons with questions, there must be also at least one question. v. Price in eShop – is the price that will be payed by your customer. The revenue will be added to your wallet credit system. Please remember there is the internal LMS enroll price associated to the purchase of the course(s). We do recommend set the selling prices higher than the LMS internal fees. d. You may see the courses that are displayed in the eShop in the Course view easily. are added to the Profit account in the Wallet. The profit account is the separate account and the amount from the course that was sold via eShop is credited here. At each eShop purchase, there is also the course enrollment in order to make the course visible for the user / buyer. It means that the course has to be enrolled and the enrollment bears the course type enrollment fee, dependent on pricelist. The course enrolment fee is deducted from the amount that's received from the eshop payment. In case the selling price is lower than the enrollment fee, the amount is deducted from credit account. In case there is not enough funds on both, profit and credit account, then the system returns the message To contact system admin. a) Transfer credit from profits - means you may move your funds to the credit account for the platform internal paid enrollments. The profits are not transferred automatically for the internal enrollments, means enrollments done by the local admins. As mentioned above only the eShop enrollments have the access to deduct the profits amount. 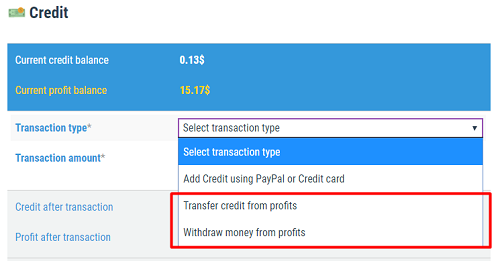 The option to Transfer the amount apppears in the list once the profit account has the value higher than 0.
b) Withdraw money from profits - allows you to create the money withdrawal request to transfer the amount to your PayPal account. There is the minimum amount set for the withdrawal request set by the system. In practice you have to reach the minimum amount but sure the whole amount may be then paid to 0 amount at your profit account. The option to Withdraw money appears in the list only in case the value on the profits account reaches the minimum withdrawal value. The withdrawal requests are then visible in the Wallet / Requests tab. You may also cancel the request here in case you have add incorrect amount or decided to leave the money in the accout or transfer those to credits. Edited 15 time(s). Last edit at 01/14/2018 07:18PM by Masteradmin.